Dozens of Israeli soldiers invaded, on Friday at dawn, Kobar village, northwest of the central West Bank city of Ramallah, abducted three Palestinians, and took measurements of the family home of Mohammad Tareq Dar Yousef, 17, who was killed following the fatal stabbing incident in Adam illegal colony, in preparation for demolishing the property. Dozens of soldiers invaded the village after surrounding and isolating it, and stormed Mohammad’s home, before informing his family that they will be back to demolish their property. 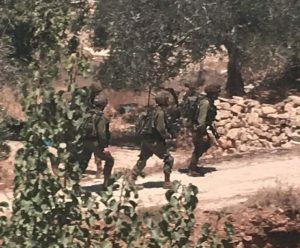 The head of Kobar Town Council Ezzat Badwan, said a large Israeli military force invaded the village, before they stormed and ransacked Dar Yousef family home, and took measurements of the property, in preparation for demolishing it at a later stage, in an illegal act of collective punishment. He added that the soldiers also invaded and searched many homes in Kobar, and abducted three Palestinians, identified as Nasrallah Yousef Mashal, 17, his brother Mohammad, 21, and Khaldoun Barghouthi, 42. 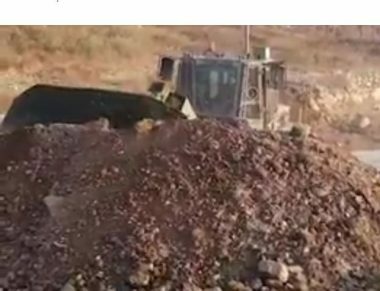 The soldiers also closed the main road between Kobar and Borham village, by placing sand hills, blocking all Palestinian traffic. Dozens of Palestinians hurled stones and empty bottles at the soldiers, who invaded Kobar, while the army fire many live rounds, rubber-coated steel bullets and gas bombs, causing many to suffer the effects of teargas inhalation. Similar invasions and incidents also took place in nearby Borham and Abu Shkheidim villages, in addition to Birzeit city, north of Ramallah. Mohammad was killed after he allegedly carried out a stabbing attack in Geva Binyamin (Adam) Israeli colony, in the Occupied West Bank, killing one Israeli, identified as Yotam Ovadia, 31, and wounding two others before he himself was killed by an armed paramilitary settler. Following the fatal incident, Israeli “Defense Minister” Avigdor Lieberman decided to expand Adam colony by approving the construction of 400 new units on Palestinian lands, in yet another act of illegal collective punishment.